This chapter offers user-friendly free applications to help teachers incorporate digital writing tools in their classrooms. The authors encourage a collaborative and inquiry-driven environment to help teachers implement new digital tools that can motivate students and develop 21st century writers. The authors use the NCTE's Definition of 21st Century Literacies (2013) to discuss digital writing tools. 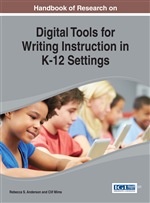 The authors offer a framework for scaffolding the introduction of these applications in K-12 classrooms and in professional development and align traditional writing process tools to digital writing tools. We (Kathy, a middle and high school English Language Arts (ELA) teacher, and Keri, a former middle and high school ELA teacher and current university professor) met through our local national writing project site. A shared interest in digital writing in our classrooms led us to collaboratively develop professional development for K-University teachers that would motivate teachers to incorporate more digital tools in their classrooms. In fact, we wanted the teacher-participants in the professional development we led to do more than just try a new tool. We hoped that digital tools might inspire more writing in the classroom and a new perspective on teaching and learning. Students of all ages are online more and more and at younger and younger ages. Common Sense Media (2013) reports that 75% of students ages zero to eight have access to mobile devices (up 23% in two years) and tablet ownership for this age group has increased from 8% to 40%. And, these are elementary students! In fact, in 2013 babies and one-year olds have used smartphones as much as eight-year-olds did two years ago. While younger children use mobile devices, tablets, and Internet devices of all kinds more frequently, the Pew Internet and American Life Project (2013) reports that 75% of Advanced Placement and National Writing Project teachers indicate that “the Internet and other digital tools have added new demands to their lives [ . . . ] by increasing the range of content and skills about which they must be knowledgeable.” Forty-one percent report that Internet and digital tools “require more work on their part to be an effective teacher” (p. 2). Over 75% feel the need to be more knowledgeable; we fear that this need to feel more knowledgeable can hinder the implementation of digital tools. In a book focused on digital tools for writing instruction in K-12, we attempt to answer the following question: how do teachers balance the demands of teaching writing with digital tools without needing to feel like a digital expert? This chapter offers a continuum to move from traditional paper and pen writing processes to multimodal literacies. For most teachers, as the Pew study reveals, traditional paper and pen approaches to writing instruction feel like they require more work, require more knowledge, and make us less comfortable. For K-12 students, digital writing tools may feel like less work and require less perceived knowledge. Essentially, they may feel more comfortable with digital tools than their teachers. We see traditional writing processes and digital processes along a continuum that helps us to take into account the skills and abilities of different audiences. The continuum helps us to create a set of literacy activities that move from print to digital and back again and, for those especially uncomfortable, translate pen and paper practices into digital writing practices and accompanying tools. Beginning with the standard education philosophy to tap prior knowledge, we share advice and tools to implement digital tools learned through offering digital writing professional development for K-12 teachers of all content areas and from real-world classroom examples gleaned from Kathy and Keri’s classrooms. The goal of this chapter—and the goal of the book—is for readers to find new ways to incorporate digital tools into the teaching of writing. The tools we use with middle and high school students are the tools we use in professional development with teachers. The ideas provided in this chapter can be implemented for K-12 and in professional development for K-12 teachers. Simply, students and teachers have a wide variety of experiences with digital literacy. We start with what may be familiar, if not more comfortable, and translate traditional tools of writing with digital tools of writing that can be found free online.